Purple Light chrysanthemum. Photo by Connie Oswald Stofko. The chrysanthemum has been enjoyed for thousands of years. It was cultivated as a flowering herb in China as far back as the 15th Century B.C., according to the National Chrysanthemum Society. The City of Buffalo is a mere upstart compared to ancient China, but we have enjoyed chrysantheums throughout our history, too. For more than 100 years, the Buffalo and Erie County Botanical Gardens has held its annual Chrysanthemum Show, which is the longest running tradition at the Botanical Gardens. The show continues through Nov. 13. Admission is $8 for adults, $7 for seniors & students, $4 for children ages 3-12, and free for members of the Botanical Gardens and children under 3. Hours are 10 a.m. to 5 p.m. daily. The Botanical Gardens are located at 2655 South Park Ave., Buffalo. Golden Rain chrysanthemum. Photo by Connie Oswald Stofko. You can see photos from last year’s show here, as well as read about how the Botanical Gardens trains the mums to grow so tall. This year’s show offers new additions. All mums belong to the Compositae or Asteracea family, which is the daisy family, according to the National Chrysanthemum Society. The mum is related to dahlias, sunflowers, marigolds, zinnias and cosmos. What looks like a flower on a mum is actually hundreds of small flowers called florets. 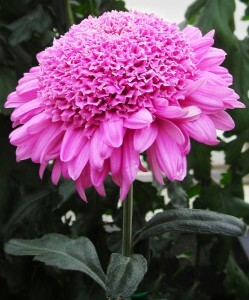 The chrysanthemum has two types of florets. The ray florets would be called petals on a daisy, and disk florets are the center florets in a daisy-type of bloom. 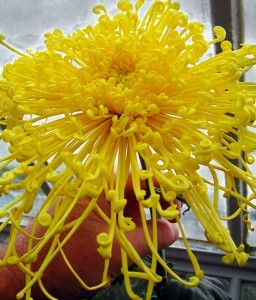 Fort Smith chrysanthemum. Photo by Connie Oswald Stofko. All classes of chrysanthemums have both types of florets. However, in many of the classes, the disk florets are not apparent. Since only the disk florets can reproduce, the plant breeder uses a pair of scissors to uncover the disk florets for pollination and the development of new cultivars. 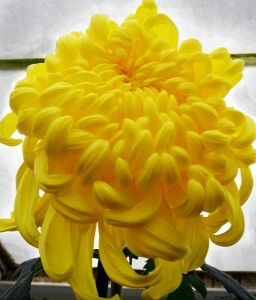 There are now so many types of chrysanthemums, the National Chrysanthemum Society divides bloom forms into 13 classes. The chrysanthemum is the flower for November.